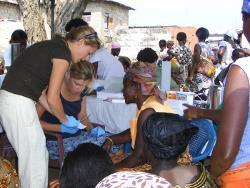 Volunteers now have the opportunity to work with a pioneering HIV/Aids programme in Ghana. As a volunteer you will not only learn about the HIV/Aids situation in Ghana and the stigma surrounding this virus, but will also get to observe and work directly with patients who are suffering. With an increase in the number of Aids cases Ghana has been forced to respond to this issue and is now working towards finding a lasting solution. The goal is to prevent new HIV infections as well as to mitigate the socioeconomic and psychological effects of HIV/Aids on individuals, communities, and the nation. One of the hospitals working towards achieving this goal is the Police Hospital in Accra. It is a large government run hospital which opened in 1976, Projects Abroad have sent medical volunteers here for many years. The Police Hospital started its HIV/Aids control programme in 1998 and it has grown from strength to strength over the past few years. In order to prepare volunteers for what will be an eye opening, emotional yet extremely rewarding project, you will be provided with a three day training course on arrival in Ghana. This intense training will help you become familiar with counselling patients, testing for the virus and spending time with people with HIV and Aids. Anti-retro viral therapy clinic: for HIV/Aids patients who are receiving treatment. Prevention of mother to child transmission: antenatal cases are counselled and screened for HIV/Aids. Mothers who are infected follow a programme to prevent them from infecting their unborn babies. The patients who have HIV/Aids in the local community meet on a regular basis and volunteers spend time with these patients to help them understand more about the virus. 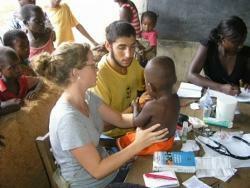 Volunteers also travel to schools to do outreach programmes about HIV/Aids. This project will often be emotionally demanding, but as a volunteer you will be working towards a very worthwhile goal and will work alongside some inspiring people. This project is available for two weeks if you don't have time to join us for a month or more. This project has been selected by our local colleagues as being suitable for short term volunteering for both the host community and the volunteer. Although you will gain a valuable cultural insight and work intensely within the local community please be aware that you may not be able to make the same impact as someone volunteering for a longer period.